In the continued efforts to develop and promote the sport of basketball globally, The SBA Sports Management and Entertainment Group has contracted with Sportz India and India's Department of Sports and Youth Affairs to collaborate on a series of basketball initiatives to support the development of basketball throughout India. As an initial step the SBA will send former NBA Legend Robert Reid to India June 2nd - June 7th to work with coaches, trainers, and the top players from India going over a number of aspects of the game. While in India Robert will work directly with the Department of Sports conducting a series of clinics and training sessions designed to assess the current talent level and coaching techniques in India. Mr. Reid will also be a special guest at the 57th Dhanoa Junior National Basketball Championships featuring the top players in India. Both the SBA and Robert Reid are excited to work with Sportz India and the Department of Sports and Youth Affairs to bring basketball excitement to India spearheading the development of the sport. 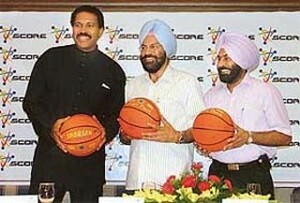 THE Department of Sports, Punjab, has invited National Basketball Association (NBA) legend Robert Reid's to hold nine special training sessions to train the basketball coaches of Punjab and other parts of the country.The sessions will be held at Ludhiana in the first week of June at Guru Nanak Stadium. While announcing the decision of the department in Chandigarh on Friday, Punjab Director of Sports Pargat Singh said, "The objective behind holding such sessions is to raise the bar for Indian basketball players and the coaches in India." "As the clinic immediately follows the 57th National Junior Basketball Championship to be held in Ludhiana from May 27 to June 3, The schedule for the trip has been carefully crafted to get the maximum benefit out of this exercise. Nine sessions in three days will broadly cover diverse aspects of the game like, nurturing talent and improving skills, technical nuances and the latest advancements thereof and injury management and feedback," Pargat added. India is all set to get a taste of NBA flavour as former Houston Rockets player, Robert Reid heads eastwards to give lessons in basketball in Ludhiana from June 3-5. "India is hot, warm and spicy. Ironically India, has always been close yet so far from me, but I'm glad it's finally happening," says the six-foot-eight-inch tall star who had an illustrious 11-year stint with Houston Rockets in the NBA league in the '80s. Reid's trip, on the invitation of the sports department of the Punjab government, coincides with the 57th Junior (U-18) National Basketball Championship for boys and girls. He will conduct three interactive and training sessions for players and coaches. "The objective of this trip is to raise the bar for Indian basketball. The game is changing globally, so why should we rely on age old forms of training and practice," says former hockey star Pargat Singh, who is at the helm of sports affairs in Punjab. Adds, Sunil Yash Kalra, consultant to the Punjab sports department, "Reid is a name to reckon with in the US for basketball coaching and we hope to utilise his talent here." Reid is presently the national spokesperson for the NBA to China. On coming to India to promote a game, which is a non-entity here, Reid says, "Every country has a number one immensely popular sport and then you have two, three and four. But just because a sport is popular does not mean that others don't exist." Right said Reid! The King of Rebound Attack all set to Hone Indian Talent in Ludhiana, June 3: The King of Rebound Attack, Robert Reid will train the Indian basketball coaches in a special nine-session clinic to be held at Guru Nanak Stadium immediately after the 57th Dhanoa Junior National Basketball Championship concludes. ''The idea to rope in international players to raise the bar of the Indian basketball coaches and the players was proposed by Director of Sports, Punjab, Pargat Singh," said Chief Parliamentry Secretary (Sports and Youth Affairs) Rana Gurmit Singh Sodhi. ''We are looking forward to invite legendry players from other disciplines such as cycling, shooting, athletic, boxing and others as well so that we can deliver better results in the 2008 Olympics and 2010 Commonwealth Games,'' Sodhi added. Introducing Reid, Sodhi said, "The National Basketball Association's Robert Reid had a stellar career in the prestigious in the United States of America. He had a unique achievement of playing 13 seasons in the NBA from 1977 to 1991. Out of them, he played 11 seasons for Houston Rokeets (1977 to 1988). He has played along side the legendary Michael Jordan, Kareem Abdul Jabbar and was nicknamed as the 'King of Rebound Attack'.